Te Pãtaka Kõrero O Te Hau Kapua Devonport Library is a 21st century library for Auckland’s North Shore. 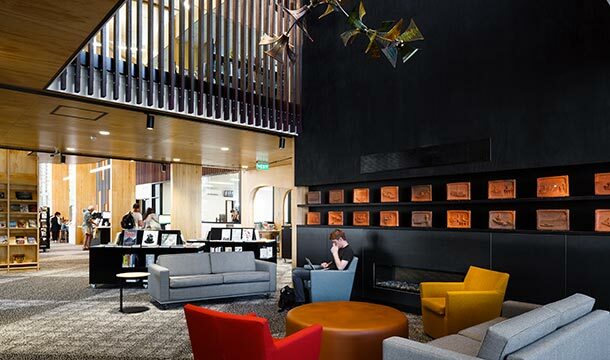 The project was undertaken by Auckland Libraries and Auckland Council’s Project Delivery Unit team (formerly Major and Special Projects), with consultation across the spectrum of internal and external stakeholders. Extensive consultation with the Local Board gained appropriate funding for a new building to replace the existing dated, dark, 733sqm leaking library. An independent review confirmed that the park like setting of Windsor Reserve was the most appropriate site. At the outset of the project, the RDT Pacific’s highly experienced Quantity Surveyor KT Tan was engaged to provide QS services, with Intermediate Quantity Surveyor Gus Fepuleai joining him during construction. From a cost management perspective, a significant challenge was a tight budget, necessitating a value engineering exercise during the design phase. 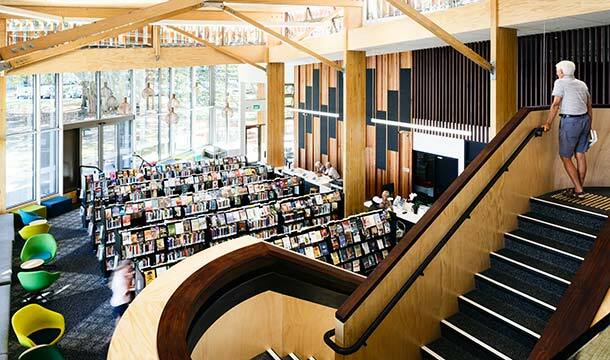 Before contracts were awarded, the RDT Pacific cost management team set out a ‘shopping list’ of options and priorities for Library and Council to consider. During the construction stage, this allowed some cost saving on lower priority elements which is critical to complete the project within budget. RDT Pacific was able to provide invaluable input that saved the client money and avoided unforeseen costs down the road. Tan advised the Council to implement a schedule of rates in the contract as a cost control tool for monitoring unforeseen variation order costs. If this hadn’t been the case, the contractor would do it on the charge up basis, with much higher associated costs. An addendum clause was included for onsite and offsite overheads and a margin as a single percentage, for all variation orders, as opposed to a standard NZS3910 contract with dual percentages. This helps to reduce the cost of variations. While the design retained the 1953 building’s footprint, there was plenty of scope to develop new ways of delivering the library experience and maximise usable space. Customer focus groups and community feedback helped to inform the design, which strikes a balance between spaces for people and space for books and other resources. A curving staircase doubles as a bookcase.Glue-laminated timber makes up the majority of the structure, with double height ceilings and a mezzanine level. Adjustable louvres allow natural ventilation, while dappled sunlight and glimpses of the Waitemata Harbour enter through the large windows. The building opens into a northwest courtyard – where visitors can spill outside with a collection of beanbags for outdoor reading and learning. Carvers from five local Iwi: Te Kawerau a Maki, Ngati Paoa, Ngati Whatua, Ngati Maru and Ngai Tai ki Tamaki collaborated on the totara pare, or lintel of the main entrance, with the wish and belief that all who pass under the lintel will absorb the knowledge in the Library. Its largely open layout comprises expansive, informal zones on the ground floor and domestic scale spaces on the mezzanine, with acoustic panels to prevent noise travelling between them. The space strikes a balance between the louder, interactive activities, and the ability for people to find a peaceful space to read or work. Natural materials such as exterior cedar cladding were selected so the building appears to sit lightly within Windsor Reserve. 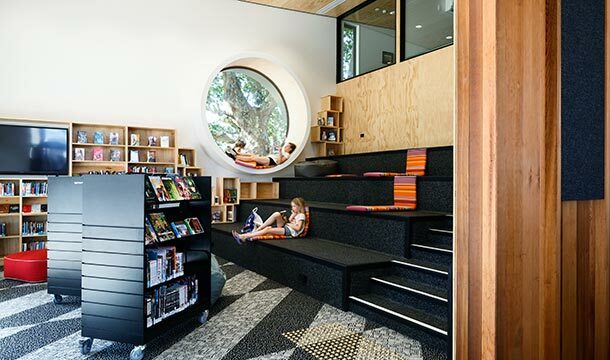 The interior is warm, colourful and cosily domestic: a plywood-clad internal staircase doubles as a bookshelf, while another bookshelf hides a secret door, a teen area incorporates a signature Athfield porthole window and living-room style zones feature wide gas fireplaces and comfy armchairs. A local feline fixture named Benjamin even has his own electronic cat door. 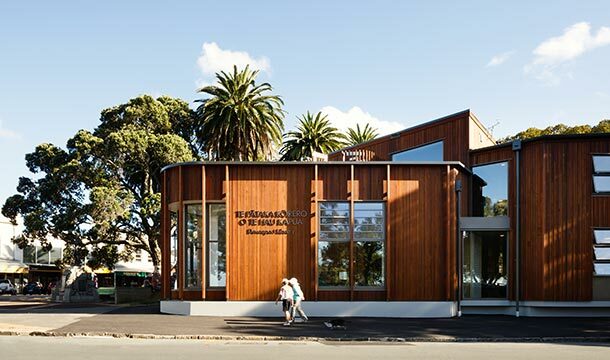 The ambitious January 2015 completion date set for Te Pātaka Kōrero o Te Hau Kapua Devonport Library was achieved – and on budget – thanks to the hard work and collaboration of clients, consultants and contractors. Despite some initial reservations, the community has embraced its new space, with extremely positive feedback, and most importantly, spending time there. 2016 New Zealand Architecture Awards, as a Public Architecture winner.